If you could save a lot of money on gas by trying something new would the hassle of learning a new system be worth the cost savings to you? I imagine several years ago most people would have answered no but with the high price of fuel everyone is looking for tips on how to save money on gas. I spent many years riding the bus as part of my daily commute during which time I saved thousands of dollars not just on gas but also on parking and wear and tear on my car. Having lived in Europe for several years, where everyone rides the bus or the train, I was very comfortable taking public transportation. In major urban areas in the US people are using to hopping on a bus but throughout suburbia many people are clueless about the ins and outs of public transport. They’ve never had to use it and can be a bit intimidated by learning the system. Sure it sounds simple, just catch the bus, but it’s a whole new experience and people tend to shy away from things they’re no familiar with. I’m always amazed at how many questions people have about riding the bus. I’ll try and address some of those here and give some tips for the best experience riding the bus. Here’s an example of a bus schedule from Oklahoma City. Let’s say you lived there and wanted to commute from your home at 22nd. & Vine into work at 10th & Walnut every day. First off you’d notice that the schedule doesn’t list 10th & Walnut as a stop, not too worry. Most schedules don’t list every stop, there simply wouldn’t be enough room, so they only publish the major stops. The bus may go right by 10th & Walnut and even if it doesn’t, it will probably get you to within a few blocks of there. Many bus schedules, such as this one, will include a map of the route on the back or at the bottom so can get a feel for where the bus travels. If you don’t understand the map you can just call the local metro office and they’ll help you out. So in this example, lets say you need to be at work by 8 AM. You could catch the bus at NE 20th & Vine at 7:32 and get off at NE 8th & Lincoln at 7:52. 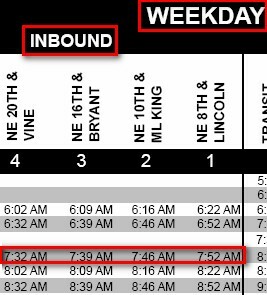 Notice you’d want the Inbound schedule, the Outbound schedule will list the times you can catch the bus in the evening on the way home. Also note that you want to look at the Weekday section of the schedule. Most weekend routes are different, which can mean different pickup times and fewer trips. The best way to get comfortable with a bus route is to ride it on a day when you’re not in a hurry and there is no schedule breathing down your neck. Most of us make a few mistakes the first time we try something, making a mistake is a big deal if you’re in a hurry but if you have time to spare a mistake isn’t such a big deal so take a trial run of the bus. Get to the bus stop 10 minutes early the first time to get a feel whether the bus runs early, on time, or late. Drivers try and meet the schedule but my experience has been that buses can come up to 5 minutes before or 5 minutes after the listed time due to traffic and other variables. You can also ask the people waiting for the bus whether it runs early, late, or right on time. Most buses will have the route number and the final destination displayed in the window. Make sure you check it before you get on, don’t assume because a bus is stopping for you that it’s the one you want. Different routes can share the same stops, just check with the driver the first time you get on. Tell them where you’re headed and ask if it’s the right bus. It might sound silly but don’t be afraid to ask. I’ve seen people who are obviously riding the bus for the first time, too intimidated by the new environment to ask questions. They end up getting on the wrong bus and going to the wrong place simply because they didn’t take 30 seconds to ask before getting on. If you’re going to commute regularly I’d recommend buying a buss pass. You almost always save money with a pass as opposed to paying for each trip individually. You might also be able to get cheaper fares through your job. It’s also easier, you just get on and swipe your buss pass rather than having to fumble around with putting in money every time. If you are going to pay with cash be aware many buses have automated ticket booths that only accept exact change. Obviously you’ll want to take a schedule along with you the first time you ride the bus. As you get closer to your destination start to pay attention to where you’re stopping and how close you are to where you want to get off. One way to do it is tell another rider where you want to get off and ask them to let you know when its coming up. The bus will either have a button to push or a cord to pull to let the driver know you want to get off at the next stop. Make sure you signal before you get to your stop or the driver might just drive on by. If you have to switch busses as part of your commute, make sure to ask the bus driver for a transfer. Most metro systems allow you to travel across multiple bus routes for one fare if they’re all part of one trip. If you forget to ask for a transfer the driver of the next bus you get on will ask you to pay again. If the whole reason you’re riding the bus is to save money you don’t want to have to pay twice for the ride. Of course riding the bus won’t eliminate the need for spending money on gas. Some days you’ll have to drive in because you need to get there early, leave late, or maybe run errands after work. Depending on where you live you may also have to drive partway into town to a park and ride, parking your car in a lot designed for commuters then catching the bus from there. Even though you won’t eliminate your gas bill completely, riding public transportation can drastically cut the amount you spend on gas. Combine that with strategies such as getting cashback with one of the best gas credit cards and gas rebates from grocery stores and the prices at the pump won’t take quite the same bite out of your paycheck. Google Maps has great feature that show hows to get from point A to point B, bus numbers and routes. I’ve coded a web-based calculator that tells you how much you can save by riding the bus. Click my name for the link. I am using buses (in Vancouver) for the first time in my over 40 years of life…and although the system here is great it is terrifying. To get the most out of riding the bus/sky trains you need to have a good idea of where you are going and how the city is laid out–things I am missing as a tourist. I wish I’d learned to be an effective user of public transit earlier in life! Monty, Walking is nice because you don’t have to mess with bus schedules but for most distances walking isn’t really practical. In terms of the stigma some people associate with public transportation, my take is, if you can save a lot of money, who cares what other people think. Irina, I agree the time to yourself is a nice benefit of riding the bus. I have been riding buses for over a decade in Miami. I don’t own a car. In addition to riding a bus, I ride Metro-Rail, Tri-county Tri-Rail, Greyhound buses for tri-county rides and I also walk a lot. I think the stigma for taking the bus is still pretty negative. I know that I would rather walk than take the bus. This wasn’t the case when I lived in a larger city with a better transit system. If I took the bus, I don’t know that I would openly admit in public that the transit system was my main source of transportation. Although it’s a good alternative.